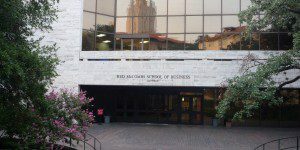 The UT Austin Executive MBA program at McCombs School of Business is completed over the course of two years with classes all day on alternating weekends running from 8 a.m. to 5 p.m. on Fridays and Saturdays for four consecutive semesters. Each year starts with a week-long executive seminar in preparation of the year. The year ends with another week-long seminar where students practice and apply what they’ve learned. At the end of the second year this seminar is held at an international location. The UT Austin Executive MBA curriculum is based on a cohort system, consisting of 42 credit hours worth of classes. Students are put in groups of about five to encourage teamwork and development of leadership skills. The mentor program also assigns each student a mentor from the previous year’s class. Three or six hours of special study courses; a Global Study Tour with the full-time MBA students; three or six hours of graduate coursework selected from the full-time MBA program’s electives; or three hours of the Washington Campus elective, a three day residency program for Executive MBA students taking place in Washington DC concentrating on public policy and its impact on business. The current UT Austin Executive MBA has 59 students with an average age of 37. They have average of 14 years of work experience and an average GPA of 3.3. Forty-four percent of the class hold advanced degrees. The program cost for the UT Austin Executive MBA is$129,500. The cost is paid in four installments over the course of the program which are due approximately six weeks before the semester begins. A $2,000 deposit is required once the applicant accepts admission. There is an additional fee of $4,000-$4,600 per semester for non-Texas residents. The costs include program tuition, registration fees, textbooks, case materials, software for core courses, lodging, and meals during Executive Seminars held in Austin, and lodging and two meals per day at the international seminar (airfare not included). It also includes lunch for the Friday speaker series. Applicants to the UT Austin Executive MBA program at the McCombs School of Business must have a Bachelor’s degree or a comparable degree from a foreign academic institution. The admissions criteria strongly recommend five years of professional experience. The application process takes place online and applicants must submit a completed application, official transcripts, GRE or GMAT scores, a current resume, one professional recommendation letter and a $200 application fee. Students must also submit two mandatory essays and can submit an additional optional essay as well. The first mandatory essay asks the applicant to explain their motivation for choosing McCombs. The other mandatory essay is an introduction of the student. It can be completed in one of two formats: a 250 word essay or a one minute video. The optional essay is an opportunity to petition to waiver test scores or talk about any other concerns that the student wants to address. Test waivers will be considered for applicants with substantial work history or a terminal degree.